FREE for the next few days. Like the game? Grab the HD version too! Appolicious named Warlords one of the top 10 games of 2010! 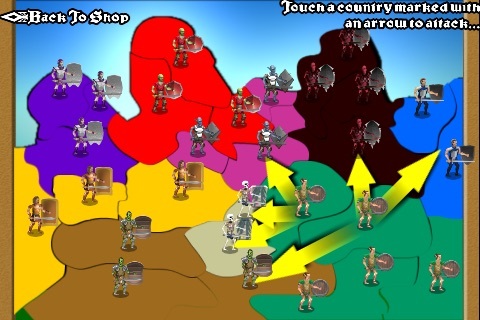 "Everything about Warlords: Call to Arms represents top notch game play, and is one of the best quality strategy games I’ve seen for the iPhone/iTouch platform." 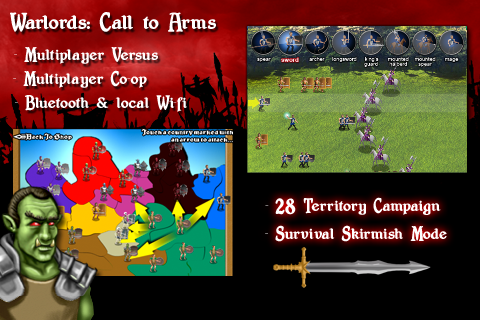 "for (the price), Warlords: Call To Arms is a fantastic value"
"This is one of the best strategy iPhone apps on the market today." "It's kind of like Plants vs Zombies, except that your plants move--and look like Warcraft characters. Relentless, addicting fun." We will be updating this continually with new stuff never seen before in Warlords. 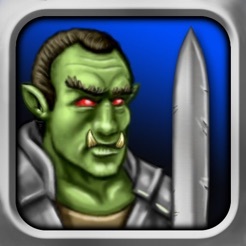 Do you dream of leading legions of orcs, elves, humans and trolls into battle? 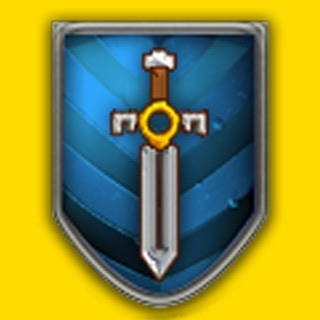 Bring your dreams to life on your phone with Warlords: Call To Arms. 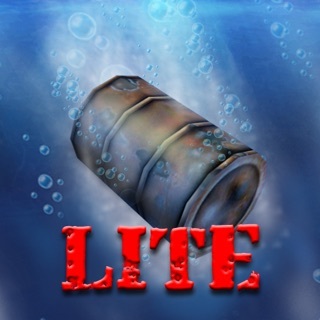 Experience the insanely addicting game-play that is based on the hugely popular flash game. See what 10s of millions of gamers are raving about! 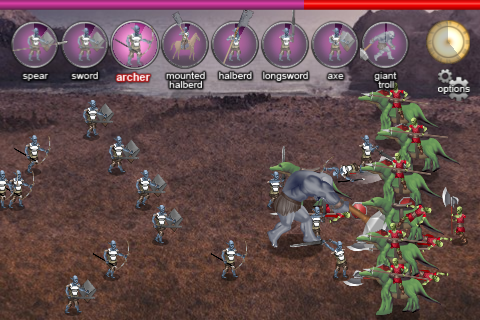 Your armies await you and your rivals approach from all sides. Seize the throne! 5 Star reviews keep the updates comming! New summer fun pack including new race,units, graphics, and difficulty level. 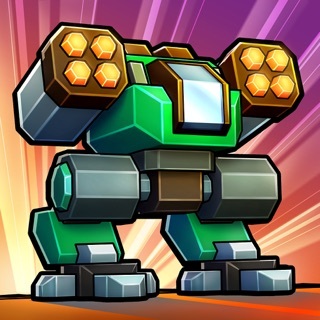 I loved this game as a free Flash web game, and I love it on the iPhone. I just wish it had multitasking support. If I get a call when I'm 90% through a battle, when I return to the game it reverts to before the battle took place. Kind of frustrating. But it's still a very fun game. Add multitasking and I'd give it six stars! 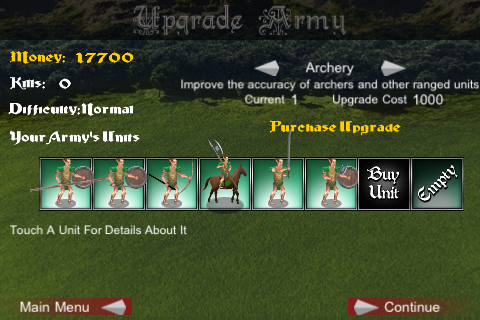 I also would like to see the unit and upgrade descriptions updated to show which upgrades modify which units. For some units it is not obvious. The only other defect I'd like to see fixed is the ranged AI. 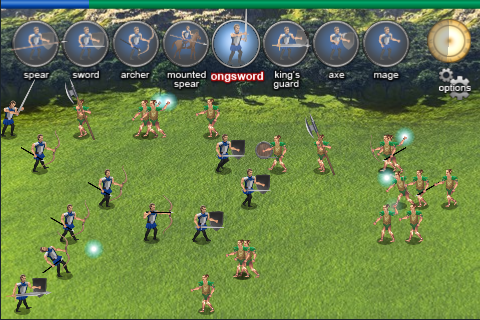 They charge forward into the melee instead of hanging back and shooting -- even when there is an enemy in range! No archer would kamikaze charge swordsmen like that. If a living enemy is in range, ranged units should not advance, period. It's been 5 years since this game came out and I just got it, and I fell in love with it. I spend all my free time on it and I can't put it down even when I'm doing other things. There are quite a few problems but the biggest for me is the fact that I can't download the summer fun fact. Whenever I press the button in the game, it crashes and the only thing I can do is close it and restart it. It won't even let me do it here on the App Store in the in app purchase center. I would really love it if you could fix this so I can enjoy the game even more. Wish it had a custom battle option, and STOP COMPLAINING ABOUT THE UPDATE!! I give this game four stars because I wish there was a custom battle option, like on the pc version. Other than that, it's an amazing portable version of the game, very nicely done. Oh, and about that update.... people, it's one freaking dollar. If you don't want to find some spare change to buy it, then don't buy the update! Or better yet, consider it an "in-app purchace" which is PERFECTLY FINE with all the other games out there! But for God's sake don't rate this game one star because they want four loose quarters from you for an IN-APP PURCHASE!!! !